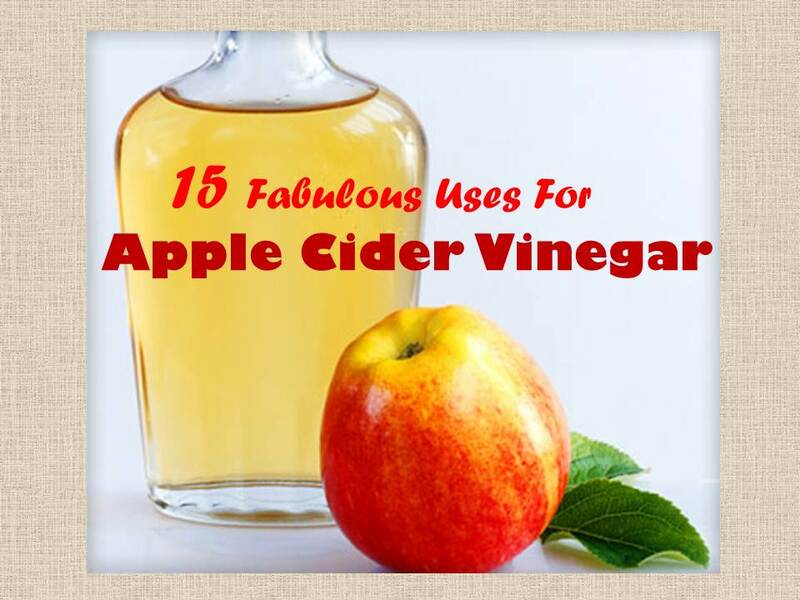 15 Kinds Of Apple Cider Vinegar Magic! Apple cider vinegar is totally miraculous! While I have heard claims that apple cider vinegar can do everything from help manage diabetes to help cure cancer, I thought I would focus this list of the basics that I have tried and can stand behind personally and that you can use today! Here are some great cider vinegar ideas for your body, beauty, pets and plants! 1. detox bath: a cup or two of vinegar in a warm to hot bath is a fabulous detox. 2. allergy relief: 2 tablespoons of honey and 2 tablespoons of apple cider vinegar in a cup of water can help with allergies. 3. diuretic: drinking a spoonfull of apple cider vinegar in a cup of water can help with bloating, as it is a natural, gentle diuretic. 4. acne treatment: 1 part apple cider vingear and 4 parts water in a solution dabbed on acne can help to treat your skin. 5. dandruff treatment: straight apple cider vinegar (or a 1/2 vinegar/ 1/2 water solution) poured on your scalp and massaged in for a few minutes can help with dandruf and other irritated scalp conditions. 6. hair shine treatment: get rid of product buildup on hair with a 1 part cider vinegar and 10 part water solution mixed and poured onto hair after your shampoo. rince well and condition your ends! 8. pet water supplement: a spoon of cider vinegar in your dog or cat’s water or food can create a healthier digestive system and acts as a natural anti-fungal. experiment to see if they like it in their water or food better! 9. weed killer: straight cider vinegar on weeds in the garden can help keep them at bay. 10. flowers last longer: fresh flowers can last longer with two teaspoons of cider vinegar and 2 teaspoons of sugar in the vase of water. 11. fruit fly trap: a bit of cider vinegar poured in a cup filled with vegetable oil can dramatically reduce fruit flier in your kitchen if you have an eruption of them in the summer. it acts like a natural magnet and the flies get trapped in the oil. 12. salad dressing: a tablespoon of cider vinegar, about 1/4 cup olive oil and some fresh garlic and herbs crushed is just about the healthiest salad dressing you can use! 13. heartburn treatment: drinking a spoonful of apple cider vinegar in water can help with heartburn. 14. bug bite help: a little straight or partially water-diluted vinegar can take the itch out of bug bites. Spring Foods For Spring Renewal! Five Fun Ways To Bring More Energy To Your Dreams Every Day! The Most Empowering Feng Shui To Help You Bring Your Big Dreams To Life! Helps cure gout, headaches, and upset stomachs. Previous post: Life Feng Shui: Making Mistakes Means You Are Really Living! Next post: Take Advantage Of The Beauty In Beach Days!